New GO! Solutions™ Meal Mixers help support common health issues in dogs with functional ingredients you can see. Orlando, Fl. (March 21, 2018) – As a leader in pet nutrition, Petcurean is introducing functional, freeze-dried meal mixers for dogs, filling a gap in the marketplace for consumers seeking specialized solutions to help support common pet health issues. The GO! Solutions™ Meal Mixer line features four specialized recipes for dogs: Digestive Health Turkey Meal Mixer™, Hip & Joint Support Pork Meal Mixer™, Skin & Coat Care Salmon Meal Mixer™, and Weight Control Turkey Meal Mixer™. Each recipe is made with freeze-dried nutritional and functional ingredients including single source primary proteins and whole fruits and veggies that you can see. As pet parents seek new ways to customize their pet’s diet, the integration of meal mixers and toppers has grown, with more than a quarter of pet owners adding them to their dog’s diet1. Petcurean’s innovation is to offer not only products with great taste, but to provide functional ingredients for specific dietary needs. Even picky-eater pets can’t resist the tasty chunks of freeze-dried pork, turkey, salmon, whole cranberries and blueberries, New Zealand green mussels, and bits of pumpkin. From achy joints and tender tummies, to itchy skin and that spare tire around the middle, GO! Solutions Meal Mixers add a functional boost of nutrition to aid in supporting many of these common issues. GO! DIGESTIVE HEALTH™ Turkey Meal Mixer: De-boned turkey with pumpkin, probiotics and pre-biotic fiber from chicory root to support the maintenance of healthy gut bacteria. Pumpkin is a great source of dietary fiber, and prebiotic fiber acts as food for probiotics (good gut bacteria). GO! HIP + JOINT SUPPORT™ Pork Meal Mixer: De-boned pork with glucosamine, chondroitin, turmeric, and New Zealand green mussels work together to help maintain healthy joints. New Zealand green mussels are a natural source of chondroitin and omega-3 fatty acids, which, along with turmeric, provide anti-inflammatory properties. GO! SKIN + COAT CARE™ Salmon Meal Mixer: De-boned salmon and salmon skin provide omega-3 fatty acids to aid healthy skin and a shiny coat. GO! WEIGHT CONTROL™ Turkey Meal Mixer: De-boned turkey combined with psyllium husk provides a sense of tummy fullness to help avoid over-eating. The freeze-drying process locks in maximum nutrition by removing water from fresh meats, fruits, and veggies through a vacuum process that gently turns liquid into vapour, thus maintaining the nutritional integrity of each ingredient. What results are tasty chunks of whole ingredients that add functional benefits to a dog’s diet and get them excited for mealtime. The process may be technical, but the effect is pure and simple: concentrated, functional nutrition. As with many of Petcurean’s other GO!® recipes, the new Meal Mixer recipes are free of grains and gluten, and have zero corn, wheat, soy, by-products, added growth hormones, antibiotics, artificial colors, flavors, or preservatives. 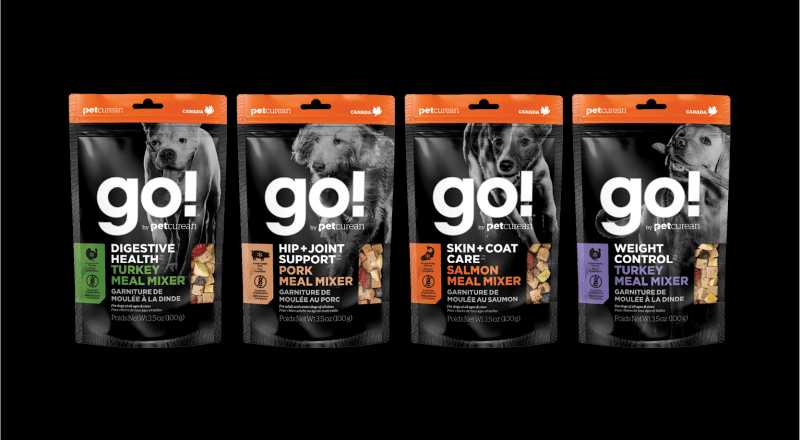 Petcurean’s new GO! Meal Mixers will be available at independent pet specialty retailers nationwide this spring for $11.99 MSRP for a 3.5oz bag. For more information about the GO! Meal Mixer recipes, please visit www.Petcurean.com/go-meal-mixers. About Petcurean – Petcurean is a family-owned Canadian company that creates premium-quality pet food recipes; GO!, NOW FRESH, GATHER and SPIKE TREATS for dogs and cats (and cats and dogs). GO! provides solutions for your pet’s unique dietary needs; NOW FRESH offers dry and wet pet food recipes with 100% fresh meat and fresh omega oils; GATHER is crafted from certified and organic ingredients, sustainably produced; and SPIKE lets you reward your dog with treats made using all natural ingredients. Petcurean pet foods are sold exclusively through pet specialty retailers in Canada, the United States, and more than 25 countries internationally. At Petcurean, with every decision they make and every recipe they create, they put pets first. Please visit www.petcurean.com to learn more.